"The most valuable of all talents," Thomas Jefferson famously said, "is that of never using two words when one will do." While true for speech and writing, this quote is particularly apt to the realm of writing. Since we speak faster than we read, it's easier to get away with a burdensome bit of text in our everyday speech. When writing, however, we need to cut to the chase. In fact, don't you think Jefferson could've edited his famous phrase to something like, "The most valuable talent is never using two words when one will do"? Or, "Use fewer words"? These ten tips for writing clear, concise sentences will allow you to position your thoughts in a golden frame free of imperfections. Let's get to it. Our first tip asks you to choose the word that most accurately expresses your meaning. Many of our words possess denotation and connotation. That is, they have a literal meaning (denotation) and an emotional or understood meaning (connotation). For example, if you use a word like "sneaky," people can interpret that a couple different ways. They might wonder if you mean dishonest and mischievous (in a derogatory way), or surprising and silly (in a fun-loving manner). Her deviant acts left a lot to be desired. Her silly, fun-loving nature made our road trip one for the books. I read in order to learn more about the world around me. I read to learn more about the world around me. He'll be back in a period of time. He is enjoying his new shoes. He enjoys his new shoes. A decision was made by Allie this week to create all the illustrations for her novel. This week, Allie decided to create the illustrations for her novel. See how this ties directly into rule number two? Avoid unnecessary words and phrases when you can get right to the heart of the matter with the present, active voice. For more, enjoy Active Voice Adds Impact to Your Writing. 4. Get Rid of "That"
This is an example of a sentence that works. We decided that we were going to the store. We decided we were going to the store. In truth, we probably overuse "that" 90 percent of the time. 5. Avoid Starting with "There Is"
There are three students who committed a crime. Three students committed a crime. In this case, why use eight words when five will do? In my opinion, I'd rather you research a bit more before taking the plunge. I want you to research more before taking the plunge. "In my opinion," and "I'd rather" express the same idea. 7. Question the Use of "Really"
Really, I just wanted him to leave. So, it was apparent that she wanted him to leave. The same question can be posed to each word. Do you "really" need them? Nine times out of ten, "very" can be cut out of your copy completely. If you do not have $15, you will not be able to afford a new batch of incense. You need $15 for a new batch of incense. If you want to be a good student, it's important not to procrastinate. A good student does not procrastinate. Not only have we eliminated the "if" clause, but also an unnecessary phrase "it's important not to." Plus, doesn't the second version sound more definitive and direct? She quickly jumped off the couch. She launched off the couch like a pellet out of a BB gun. Rules, rules, more rules. No wonder grammar gets a bad rap. Truth is, the rules serve to make you a better writer, not impinge your writing. Embrace them; they'll make you stronger! Whatever you do, don't let the rules strangle your creativity. When you first sit down to write, it's best to purge all your thoughts and words. Get them onto the page. Then, you can circle back and tweak "this" and remove "that." If you get too caught up in selecting the right word or eliminating the wrong phrase, you might lose your steam (as well as some of your best ideas). This is a common rule of thumb when writing short stories. Perhaps you'll test your aptitude for clarity and concision with a short tale or two. If so, Get Creative: How to Write a Short Story will get you there. Until then, happy editing! "10 Tips for Writing Clear, Concise Sentences." YourDictionary, n.d. Web. 24 April 2019. <https://grammar.yourdictionary.com/grammar/writing/10-tips-for-writing-clear-concise-sentences.html>. “The most valuable of all talents," Thomas Jefferson famously said, "is that of never using two words when one will do.” While true for speech and writing, this quote is particularly apt to the realm of writing.Since we speak faster than we read, it’s easier to get away with a burdensome bit of text in our everyday speech. When writing, however, we need to cut to the chase. In fact, don’t you think Jefferson could’ve edited his famous phrase to something like, “The most valuable talent is never using two words when one will do”? 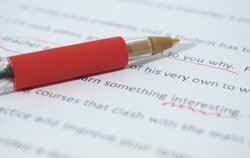 Or, "Use fewer words"?These ten tips for writing clear, concise sentences will allow you to position your thoughts in a golden frame free of imperfections. Let’s get to it.